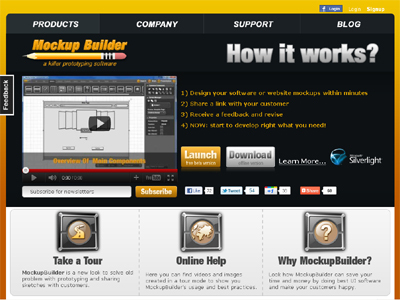 Mockup Builder is solution to help design software or websites and reduce time and costs spent. This works for every side that involved in product creation process, being it product owner, software developer/company, designer, UX expert. Mockup Builder proposes easy and efficient way to produce software and website mockups and gives ability to collaborate between all of the parts of software creation process. This is done in terms of standalone version or fully functional SAAS system. IPAD, Android tablet versions are also planned, as well as plugins for project tracking software such as BaseCamp, JIRA, FogBugz, Pivotal Tracker.